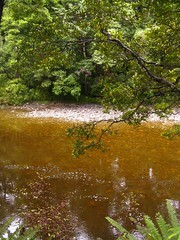 Park River, 300 metres below. Wellington Anniversary Weekend meant an opportunity to have a slightly longer trip in the Tararuas than the usual weekend, and we used it to visit the middle part of the main range, beginning from Otaki Forks and ending at Poads Road near Levin. The forecast leading up to the weekend was uninspiring, suggesting several large splodges of rain would position themselves all over the lower North Island, especially on Saturday, but perhaps clearing a little after that. There was no forecast of strong wind and we went ahead with the plan, but somehow boasting about a lack of strong wind didn’t convince my work-mates not to laugh at me when I left to visit the Tararuas on Friday night. 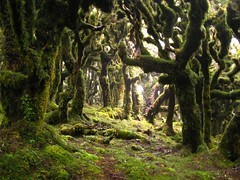 Location: Tararua Forest Park, Otaki Forks to Poads Road. People: Amanda, Richard, Tim and me. Huts visited: Waitewaewae Hut (0 nights), Nichols Hut (1 night), Dracophyllum Biv (0 nights), Te Matawai Hut (1 night), South Ohau Hut (0 nights). Route: Walk up Saddle Creek and camp on the plateau, then past Waitewaewae Hut and over Shoulder Knob to Nichols Hut for the next night. 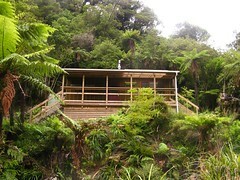 Then to Te Matawai Hut via Pukematawai, and out to Poads Road via the South Ohau River. 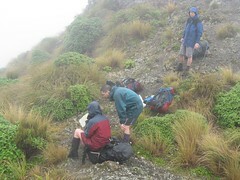 We left a van at Otaki Forks a little after 8pm, intending to swap it with another group on their way along Oriwa Ridge. A few others had signed the intentions book so we weren’t the only people braving the rain, but most going elsewhere. The only people who’d written about going our way, up towards Waitewaewae, having left earlier in the afternoon, had abruptly scribbled out their plans for a 4 day trip and written OUT. Apparently they’d changed their mind for some reason. With an hour of light left and wanting to get ahead of the rain, the four of us began walking towards Waitewaewae with an idea of camping on the plateau above Saddle Creek. Despite the rainy forecast, it was still a calm evening without much rain scheduled until early morning. The only small delay was around the significant active slip on the Waitewaewae track, but we figured it out after a few minutes. The last light of the day held out until we were well into trees near Saddle Creek, and from then on we walked with torches. In this creek in the past, during the daytime, I’ve found it easier to simply walk up the creek than to figure out the entire criss-crossing track, though I think it’s a personal preference. By torchlight I think we all decided it was much easier to stay on the track as much as possible. This track is also much more steep than I remembered it. I was too busy looking at the ground ahead of me to properly notice, but others in the party reported that Saddle Creek seems to be a haven for glow-worms. We reached our camp-site at 11pm, which thankfully wasn’t too sodden, and set ourselves up for the night. Next morning I found I was apparently the only person to have had a reasonable sleep, and I still didn’t think there had been enough of it. 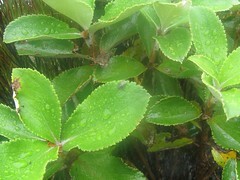 Up at 7am, the forecast rain was yet to begin, although the tent flies were sodden. We were packed and leaving by 8, towards Waitewaewae Hut before continuing on to Nichols for the night. 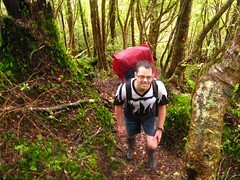 We stopped briefly at Waitewaewae, 90 minutes later, where we met a chap who’d walked in and arrived the previous night. He had an optimistic plan to head up to Te Matawai Hut, then down the entire Otaki River, apparently oblivious to the amount of humidity in the air. Despite declaring his plans he didn’t exactly seem in a rush to go anywhere, and as we left at 10am, he returned to his sleeping bag. Richard on the way up to Shoulder Knob. It turns out to be quite a big slog up to Shoulder Knob, which is at the bush-line. It’s a 900 metre climb, taking us 3 hours in all, including an odd stop along the way. We were greeted at the top by a voodoo-doll-like statue tied to the pole on the knob, just one of those semi-weird things in the back-country that I’ve trained myself to appreciate. Visibility had dropped as we approached the bush-line, and soon after leaving it we were in at least 3/4 storm gear, with the cold wind coming from the south. Actually the whole thing was very confusing, especially with no rain. It all felt like sou-easterlies but was difficult to tell, so with wind going clockwise around low pressure, perhaps the system we’d expected had gone further north? We were guessing in any case, but as time went on it was all so dramatically inconsistent with reality that we leaned towards throwing out what we knew of the following days, and just focused on getting between points of safety, the next of which was to be Nichols Hut. The wind was still fairly light, and that was the critical thing at the time. Crawford as he waits for us to arrive. 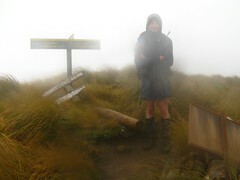 We arrived at Junction Knob just before 2pm, the point on the Tararua Main Range between Nichols and Anderson Hut, where the signpost informed us that our destination for the evening was but 90 minutes away. For the remainder of the day, we continued along the main range with about 30 metres visibility, tolerating light but icy winds from the south-east between the occasional eddies and sheltered spots. The high point along here is Mount Crawford (1482), ceremoniously marked with a short drainpipe poking out of the ground. For a few minutes we accidentally began to head down the wrong spur off Crawford, but managed to catch it once the route dissipated more than seemed reasonable and we noticed the bearing didn’t appear quite right. In the end, including this detour, it took us 2 hours from Junction Knob before we reached Nichols Hut just off the eastern side of the ridge, and it was a good sight. The door of Nichols had been barricaded on the outside with a saw-horse, and we soon found this was because the door wasn’t clicking shut properly. A couple of notes in the book indicated that the door had been discovered swinging open when people had shown up. Tim and Richard got a fire going, and we settled into an entree of cheese and crackers, followed by Amanda’s design of yummy Chorizo Couscous. The hut literature at Nichols was unexpected, especially the collection of 4 wheel drive magazines given that they were at a hut at 1242 metres altitude on the Tararua Main Range. Unfortunately not much to read, in any case. The picture magazines weren’t too enlightening either, though the latest Hunting & Fishing catalogue was advertising one of the funniest looking gun-wielding swamp monster outfits I’ve ever seen. Heavy rain finally arrived at 8.30pm, just after we’d gone to bed and almost 24 hours later than we expected. It also stopped well short of what we’d expected, only raining on and off and with nothing sustained. No wind either, though I guess Nichols is reasonably sheltered given that it’s not tied to the ground as some nearby huts are, and we fortunately had no issues with the door swinging open. The main range north of Nichols. Rain had stopped by 6.45am when Amanda dragged herself out of a sleeping bag on the lower bunk and started a billy boiling. We packed up, feasted on brekkie, and I took a few photos of the door latch to forward to DOC at a later date. We also hunted around for replacement firewood, which was difficult. For future reference I’d suggest that anyone visiting Nichols Hut from the northern direction should grab an arm-load of firewood as they leave the bush-line, only about 5 minutes away. We re-barricaded the door, and at a relaxed 8.45am, we left. Once again it was quite a dreary day outside, with thick cloud and little visibility. Figuring out a route around Kelleher. The light but icy wind was now coming from the west, for whatever reason, and we’d given up on trying to figure out how it related to the models issued a couple of days earlier. 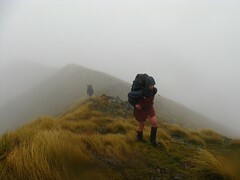 Wind wasn’t as much of a concern just now, anyway, because about 5 minutes north of Nichols Hut the Tararua Main Range dips into the bush-line. It stays there for some time, except for a brief 100 metre emergence to sidle around the eastern side of a peak called Kelleher (1152), which after 90 minutes appeared high and some distance before us. We continued past an obvious track marker below Kelleher, then sat down in a sheltered area for a quick snack, and to figure out which of the apparent routes ahead was most likely to be the intended track. Amanda and I eventually took alternative parallel options along the slope, both ending up on a short west to east spur. From here it wasn’t clear at all, but through the thick cloud it looked as if we could head towards a little knob not far away, and it’d sidle around Kelleher nicely. Moving to the knob, however, there didn’t seem to be any emergence of Kelleher behind it as we’d expected, even after checking where it should be with a compass bearing, which was actually fairly disorienting. By now we should have been able to see a clear outline, or upward-sloping ground, or something to indicate the presence of anything other than a void directly beyond in a westerly direction. 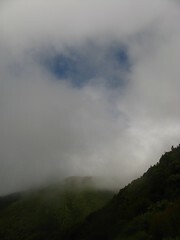 I guess thick cloud can do strange things to perception on the tops. It makes nearby things seem far away, and short climbs appear much further than they actually are, and on occasions like this it causes trampers to summit peaks like Kelleher completely accidentally. Having eliminated the alternatives, and confirming suspicions with a quick reference to a GPS, we eventually determined we were 200 metres off the side of the route we wanted along the range, and re-traced our steps. At least we didn’t waste another two hours heading down the far side, which is what a couple of people writing in the Nichols Hut book had indicated they’d done. Back-tracking to the previous marker we’d seen prior to having even sat down, and taking another look around, we quickly spotted a giant cairn that led straight back into the dracophyllum. Just over an hour further of walking, we arrived at Dracophyllum Biv, a cute 2 person hut under the trees. It’s also well tied to the ground despite being surrounded by trees, presumably for good reason. We stopped for lunch. It’d taken around 3 hours to reach our lunch spot, the track being peppered with many peaks and ongoing undulation. We thought the next section would be similar, being roughly the same length before emerging from the bush-line, but northwards from Dracophyllum Biv was much faster. 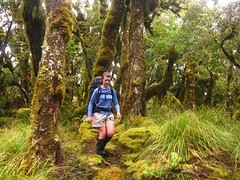 An hour or so later we were emerging into more leatherwood and dracophyllum, eventually back into nice alpine scrub. It still wasn’t exactly raining, either, which didn’t stop us from becoming saturated thanks to the fog of tiny hovering water particles that weren’t massive enough to figure out whether they should obey the force of gravity or the force of the up-draft blowing over the ridge. For the length on the tops we could clearly hear the Park River, 300 metres below to the east, and had the cloud lifted we’d have been opposite Carkeek Ridge. We never saw further than about 50 metres, however. Tim approches the turn-off near Pukematawai. The main range leading north-wards to Pukematawai undulates with several spot heights, each of which appeared distant, high and ominous, but all of which we found to be much quicker and easier to ascend and overtake than it had first appeared through the deceptively thick cloud… probably because we rarely saw far ahead in the first place. 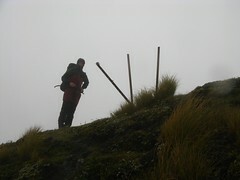 At 3pm we reached a collection of stakes poking out of the ground, just short of Pukematawai, and marking the turn-off point down towards Te Matawai Hut. At Amanda’s suggestion, we stopped on the sheltered side of the ridge for a few minutes and put on over-trousers, in anticipation of being about to walk directly into the freezing westerly wind. It was worth it, too, even just for the first few minutes during which we were most exposed. From here it was time to say goodbye to the main range. When there’s more than a 500 metre vertical drop in the space of about 2.5 kilometres, a track will generally be steep. The last stage of our day therefore became a controlled slippery slide down through the mud to Te Matawai Hut, the highlight of which was the first sign of our entire tramp of the sun finally coming out. It didn’t expose itself completely, but as we left the cloud layer on the main range, we did finally get a vague warmth forcing its way through some clouds above us. At one brief moment, there was even a small patch of blue sky. It wasn’t until a couple of hours later, however, standing on the deck of Te Matawai Hut with most of our clothes and gear hanging out in an optimistic attempt to dry them out, that some cloud properly lifted for a few minutes revealing large amounts of the main range in the distance, over which we’d spent our entire day. Much of the range is obscured by trees from Te Matawai Hut, but we could almost see as far back as Dracophyllum Biv, and the undulating shape of the ridge that we’d noticed now made complete visual sense. The first blue sky of our weekend. The main range finally emerged. Tim managed to get another fire going after some effort, and over time we hung out much of our gear inside, actually being able to get it reasonably dry on this occasion. Te Matawai Hut perhaps doesn’t get as many visitors as its size implies. It’s very large as huts go, yet every time I’ve visited (this was the third) there’s been nobody else. On this occasion it also had much better reading material, including a bunch of old FMC Bulletins. I got the one in which several people had written in to comment about an incorrect answer for question 10 in the quiz of a previous bulletin. It was something about the name of a certain kind of 3-pronged nail that was once used in climbing boots. After more cheese and crackers, we settled into a nice dinner of a certain kind of satay noodle recipe that Amanda had dreamed up. We’d just gone to bed at 9pm, and it wasn’t long after that when we heard someone enter and walk around a little. They weren’t there in the morning and never wrote in the book, but it appeared as if there was at least one other person wandering around. Perhaps they were on their way up to Arete Biv, or somewhere nearby to camp. Weird — I’m not used to people who aren’t me walking into huts at night. Heading downstairs on Monday morning. Our last day was a straightforward walk down the Ohau River. We were away shortly after 8am, and 90 minutes later following a skid further down the hill, arrived at the new South Ohau Hut. Last time I’d been here there was nothing but the fireplace of the old hut, which is appropriately the location of the new hut’s woodshed. South Ohau actually looks really nice, and it’d be easy to spend a few days relaxing there. Not being in any rush, we hung around for half an hour before beginning our walk down the river. 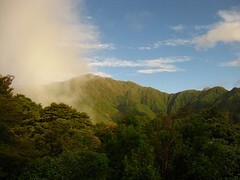 South Ohau Hut from near the river. 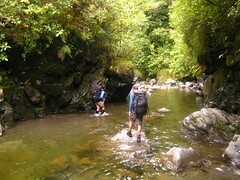 The South Ohau River itself is a slightly gorgey river, and even when it’s low as it was on this occasion it has a few tricky sections. If it were up even 20 centimetres further, it’s likely some parts would be waist deep (as Richard had experienced a few months before), and beyond that it could be very challenging if possible to follow at all. This morning however, it just took time. It took 90 minutes to reach Deception Spur, where the South Ohau meets the North Ohau, and we stopped briefly for our final lunch. The remainder of our river walk, about the same distance again but much more easily navigable, towards where it meets the track out to Poads Road, took only half that time. Just over an hour later, having walked the last section of track as well as having met the second and third people we’d talked to in three days — a couple out for a short daywalk — we were standing next to our van at the end of the Poads Road entrance to the Tararuas, nice and early to beat the holiday weekend traffic. 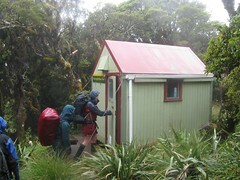 This entry was posted in tramping and tagged bagged:dracophyllum hut, bagged:nichols hut, bagged:south ohua hut, bagged:te matawai hut, bagged:waitewaewae hut, rivers, tararuas, tramping, wellington tramping and mountaineering club, wtmc newsletter. Bookmark the permalink. nice description of the tramp! a couple of weekends ago, we travelled to Waitewaewae 1nt, Nichols 1nt, to Kelleher, down Kelleher ridge to the upper Otaki , camped 1 nt, then down and back to WTWW. Nichols hut’s door is repaired. 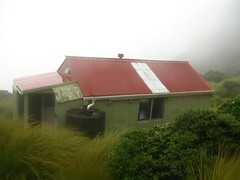 Nice Hut with grand views of the Tararua peaks and Maungahuka etc. from Kelleher we could see the whole main range which was wonderful, as the last time we were on the M range, we had visibility similar to yours! thanks for sharing your trip and good on you for taking photos in inclement weather. Heh heh, thanks for the feedback, and great to hear that the door’s finally fixed. I reported it to DOC but didn’t get much of a response back this time until I asked again to make sure they’d received the message. The people at the Kapiti Conservancy who follow up on that sort of stuff probably had other things on their mind though. Your trip sounds similar to what that guy in the sleeping bag at YTYY said he was going to do, unless he was planning to go all the way to Te Matawai first. Maybe next time we’ll see a bit more, but I like this kind of trip all the same because you get to see places in a way that many people don’t. I really enjoy taking photos in less than fine weather for similar reasons, but camera’s feeling the worse for it after a couple of years. So far I haven’t been convinced to go for the waterproof anti-shock variety. Really enjoyed reading your article and think your pics give a fair idea to the casual observer of what travel on the Tararua tops is usually like ;c) Off to Anderson Mem in a couple of weeks time and all the more keen for reading this! Thanks for taking the time to write this up!